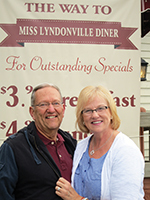 Fred and Cheryl Lowman are residents of northwestern Connecticut. Fred, a retired school teacher, enjoys carving Santa Claus figures, woodworking, reading, gardening and the wildlife of Connecticut. Cheryl, a native Vermonter, finds joy in writing and is inspired by nature, people, and the endless beauty of scenic New England. Fred and Cheryl are active in their local church and in the lives of their children and grandchildren. Dan Carsten – Illustrator For as long as he can remember, Dan knew he wanted to be an artist. Influenced by Saturday morning cartoons, he would spend hours drawing the silly stories and characters of his imagination. Today, Dan continues to bring stories and characters of all kinds to life but, he has traded in his crayons and markers for paint brushes and a graphics tablet. When not sketching and painting, Dan enjoys doing home improvement projects, skiing and watching the Boston Red Sox. Dan, a native New Englander, lives in central Connecticut with his wife, Martha, and two sons, Bennett and Eli. A Talking Crow!! 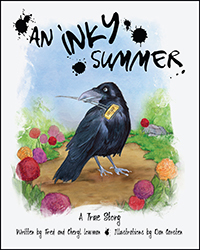 When 12 year old Freddie discovers Inky, an American crow, sitting on the fence near the back steps of his house, it is the beginning of An Inky Summer. Read this true story and laugh as this crafty and intelligent corvid upsets neighbors and relatives with his antics.